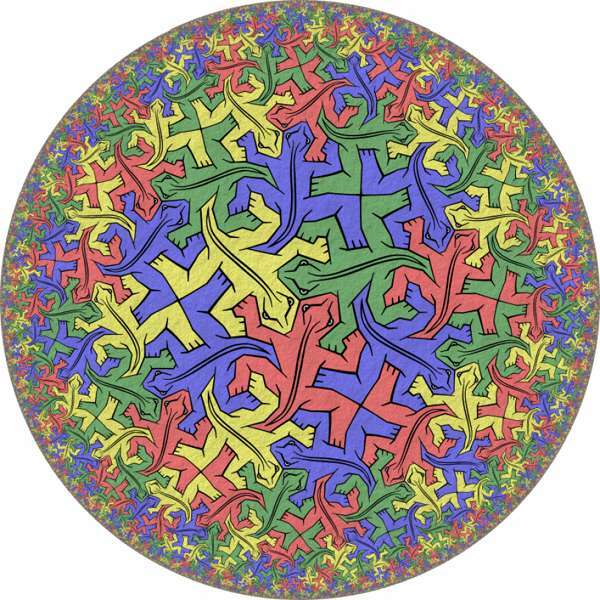 I have been fascinated (perhaps I am in love too with it) by Mathematics since I was a child. As a teenager in High School, I was a very curious student ( I am curious indeed yet) and I tried to understand some weird results I got in the classroom. This entry is devoted to some of those problems that made me wonder and think a lot out of class, at home. It took me some years and to learn complex variable function theory to understand one of the issues I could not understand before I learned complex variable. 3 years to understand a simple derivate! Yes, it is too much time. However, understanding stuff deeply carries time. Sometimes more, sometimes less. 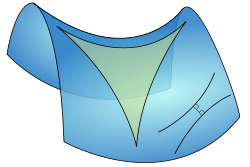 where the is the arctangent function ( the inverse of the tangent function ). then and thus and therefore Q.E.D. as before! That is, we recover the phase difference we also got with real calculus. The origin of the cancellation was in the complex origin of the arctangent function! Beautiful mathematics! The complex world is fascinating but very enlightening even for real functions! What is a triangle? It is a question of definition in Mathematics. Of course you could disagree, but it is true. Look the above three “triangles”. Euclidean geometry is based in the first one. 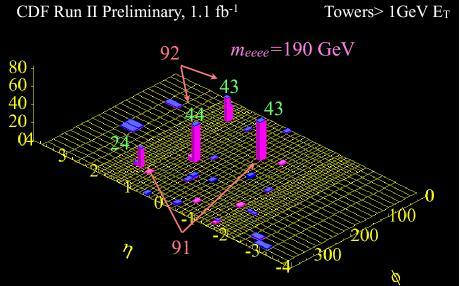 The second “triangle” is commonly found in special relativity. Specially, hyperbolic functions. The third one is related to spherical/elliptical geometry. Today’s summary: some basic concepts in arithmetics, complex numbers and functions. We are going to study and review the properties of some elementary and well known functions. We are doing this in order to prepare a better background for the upcoming posts, in which some special functions will appear. Maybe, this post can be useful for understanding some previous posts too. First of all, let me remember you that elementary arithmetics is based on seven basic “operations”: addition, substraction, multiplication, division, powers, roots, exponentials and logarithms. You are familiar with the 4 first operations, likely you will also know about powers and roots, but exponentials and logarithms are the last kind of elementary operations taught in the school ( high school, in the case they are ever explained!). Let me begin with addition/substraction of real numbers (it would be also valid for complex numbers or even more general “numbers”, “algebras”, “rings” or “fields”, with suitable extensions). Indeed the last rule can be undestood as the “division” rule, provided since in mathematics or physics there is no sense to “divide by zero”, as follows. Now, we are going to review powers and roots. Please, note that this definition has nothing to do with the “deformed” logarithm of my previous log-entry. Notations are subtle, but you must always be careful about what are you talking about! 1st. Sometimes you write . Be careful, some books use other notations for the Napier’s logarithm/natural logarithm. Then, you can find out there or even . 2nd. Whenever you are using a calculator, you can generally find and . Please, note that in this case is not the natural logarithm, it is the decimal logarithm. Are we finished? NO! There are more interesting functions to review. 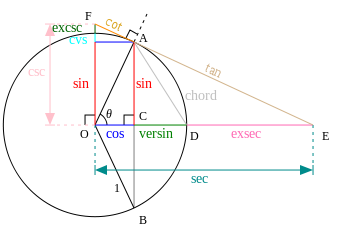 In particular, the trigonometric functions are the most important functions you can find in the practical applications. Triangles are cool! Let me draw the basic triangle in euclidean trigonometry. ii) The function (cos), defined as the ratio of the adjacent leg to the hypotenuse. iii) The function (tan), defined as the ratio of the opposite leg to the adjacent leg. The hypotenuse is the side opposite to the 90 degree angle in a right triangle; it is the longest side of the triangle, and one of the two sides adjacent to angle ”A”. 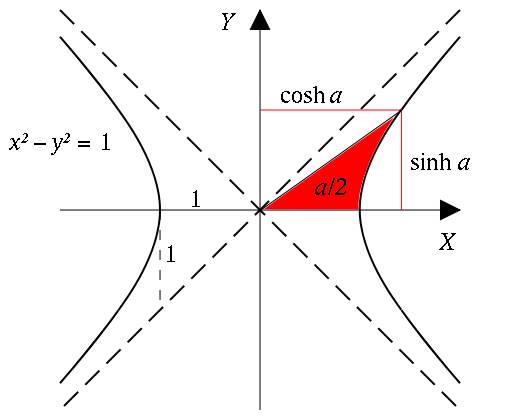 The ”’adjacent leg”’ is the other side that is adjacent to angle ”A”. 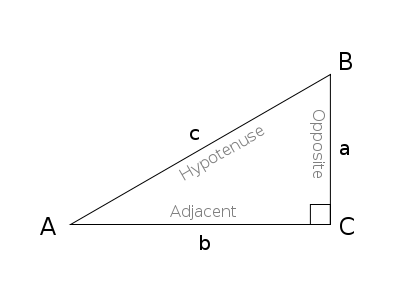 The ”’opposite side”’ is the side that is opposite to angle ”A”. The terms ”’perpendicular”’ and ”’base”’ are sometimes used for the opposite and adjacent sides respectively. Many English speakers find it easy to remember what sides of the right triangle are equal to sine, cosine, or tangent, by memorizing the word SOH-CAH-TOA ( a mnemonics rule whose derivation and meaning is left to the reader). 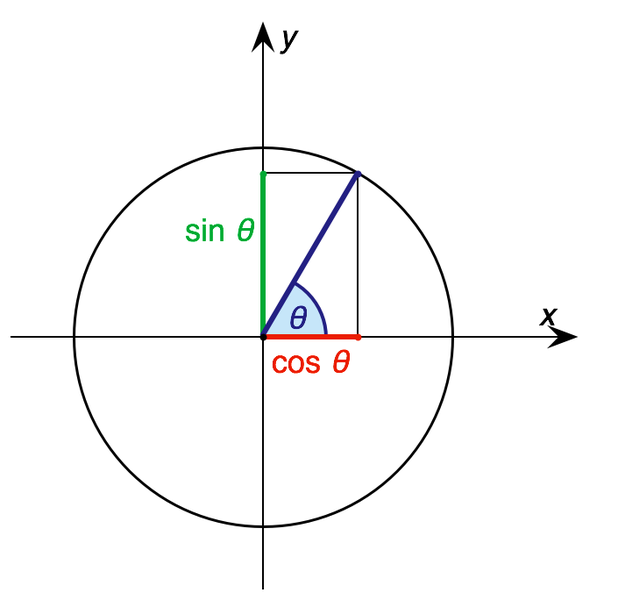 The inverse trigonometric functions/inverse functions are called the arcsine, arccosine, and arctangent, respectively. These functions are what in common calculators are given by . Don’t confuse them with the multiplicative inverse trigonometric functions. So, the Fundamental Theorem of Trigonometry is just a dressed form of the pythagorean theorem! thanks to the Euler identity. 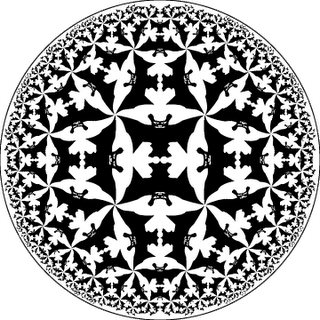 In special relativity, the geometry is “hyperbolic”, i.e., it is non-euclidean. Let me review the so-called hyperbolic trigonometry. More precisely, we are going to review the hyperbolic functions related to special relativity now. I love Escher’s drawings. And I also love Mathematics, Physics, Physmatics, and Science. Equations are cool. And hyperbolic functions, and other functions we have reviewed here today, will arise naturally in the next posts.